As the drums of the Civil War began to beat in 1861 men from the county formed themselves into two companies. The Charles City Southern Guards later became Company K, 53rd Virginia Infantry, Armistead’s Division, with George Major Waddill as Captain. 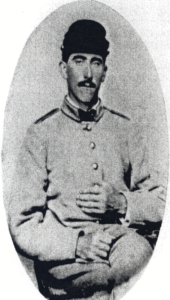 The Charles City Cavalry later became Company D, 3rd Virginia Cavalry of Wickham’s Brigade, Fitz Lee’s Division, with Robert Douthat as Captain. Soldiers from the county participated in most of the major battles from Big Bethel, June 1861 to the surrender at Appomattox April 9, 1865. Men in the infantry were a part of Pickett’s infamous charge at Gettysburg and sustained heavy losses with ten dead, including the Captain, thirty-nine wounded and others captured. Only one of the fifty men who were engaged in the battle emerged unscathed. This roll does not include persons of color who served the Confederate cause. Virtually all able-bodied free men of color, and a number of slaves, were conscripted to work on the Confederate fortifications. Three of these men later received pensions, one as a body servant and the other two for their work on the fortifications. Sylvanus Tyler Brown, a free man, served Capt. George Major Waddill as a cook, hostler and general body servant. Edmund Bradley and William Webb were both slaves conscripted to work on the breast works at Mulberry Island.